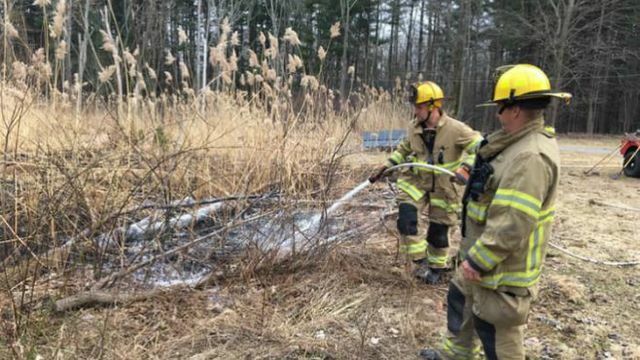 A brush fire in Chardon on Thursday, March 28, 2019. Courtesy: The Chardon Fire Department. YOUNGSTOWN, Ohio (WKBN) - More brush fires are being reported across the Valley as windy conditions prevail. Many rural fire departments are dealing with fields and wooded areas catching fire from open burning. While many suburban areas allow open burning, common sense should dictate when it is not safe to do so. According to 27 Storm Team meteorologist Alex George, windy conditions will be around through the weekend. "Winds will be fairly calm Friday and Friday night, but winds will pick up on Saturday. Gusty conditions are expected to star the weekend. Winds will be out of the south at 15 to 20 MPH, with gusts as high as 30 mph.," George said. According to the Ohio Environmental Protection Agency, an open fire is any outdoor fire that is not vented by a chimney or stack. - No wastes generated off the premises may be burned. For example, a tree trimming contractor may not haul branches and limbs to another site to burn. - Dead animals—unless approved for control of disease by a governing agency. Other open burning regulations can found on the Ohio EPA website. Contact your local municipality for open burning regulations in your community.